Are you ready for some football? With the battered and bruised Red Sox (Black and Blue Sox would be a truer nickname) in a mid-summer swoon, I'm certainly ready. Where: Patriots training camp is held on the practice fields next to Gillette Stadium in Foxborough. Based on past years, you can lay good odds that the schedule is going to change (either that or Coach Belichick is really going to work these guys from the get go). The schedule is always tentative based on the desires of the coaching staff and oftentimes the weather. Therefore, if you're interested in going to see practice, by all means check the schedule on the Patriots web site and double-check it by calling the team's hot line at 508-549-0001. Parking: The practice is free to attend, and the parking is free as well. (Yes, I said it, "Free.") Parking is along the west side of the stadium, and it's a short walk over to the fields. From US 1, enter the parking lots at P8 from the south and P6 from the north. Lots open an hour before each practice. Seating: There are bleachers along the side of one practice field on which to sit. Another popular spot is on the hillside that lies behind the end zones of the practice fields and in front of the stadium. Wherever you sit, you're pretty close to the action. If you have a camera with a good zoom lens, you should get some good shots. For the Kids: Along the west side of the stadium during Training Camp is the Patriots Experience, filled with interactive games that allow young fans to test their kicking, passing, and tackling skills on a variety of obstacle courses, football tosses, and other similar challenges. It's a popular draw for families. (All fans participating in Patriots Experience must sign a waiver form, available at training camp or online at the Patriots web site.) Note that the hours for the Patriots Experience are not the same as the practice schedule; so check the web site. (In general, the hours are usually 11-4.) Kids will also enjoy all the interactive exhibits at the Hall at Patriot Place. Even if you don't have kids, a visit to this museum dedicated to the Patriots franchise is an absolute must for Pats fans. Scoring Autographs: The players enter and leave the field near the hillside, so it's a good spot to get autographs, and a designated group of players, which rotates from practice to practice, will often sign along the front row of the bleachers when practice is over. With as many as 80 players on the field, plenty of new faces, and uniforms without names on the back, it may be tough knowing who you are watching, so print out a roster from the Patriots web site before you go or pick up a complimentary roster from the Patriots Football Weekly tent. 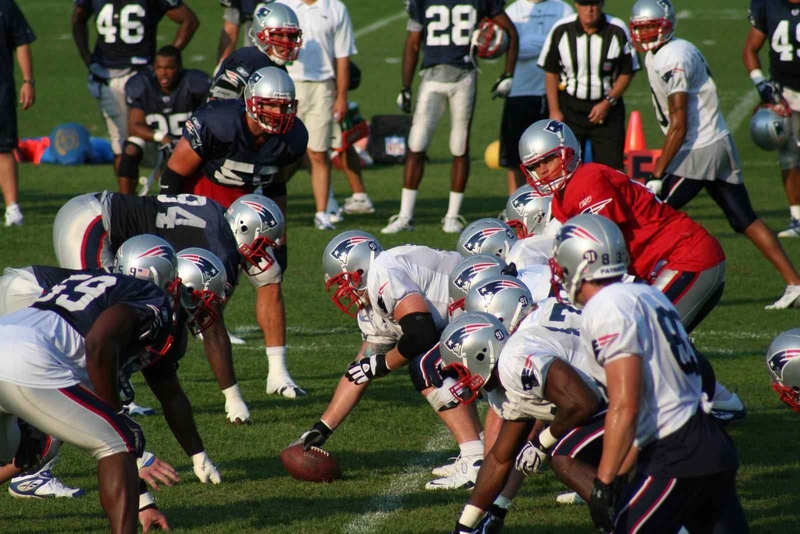 For more tips on enhancing your experience at Patriots Training Camp--and for all the information you'd ever want to know about spectator sports around Boston--check out The Die-Hard Sports Fan's Guide to Boston. I'm very excited that an exhibition featuring my photographs of the Boston Harbor Islands national park area has opened at the John Joseph Moakley United States Courthouse on Fan Pier in Boston. 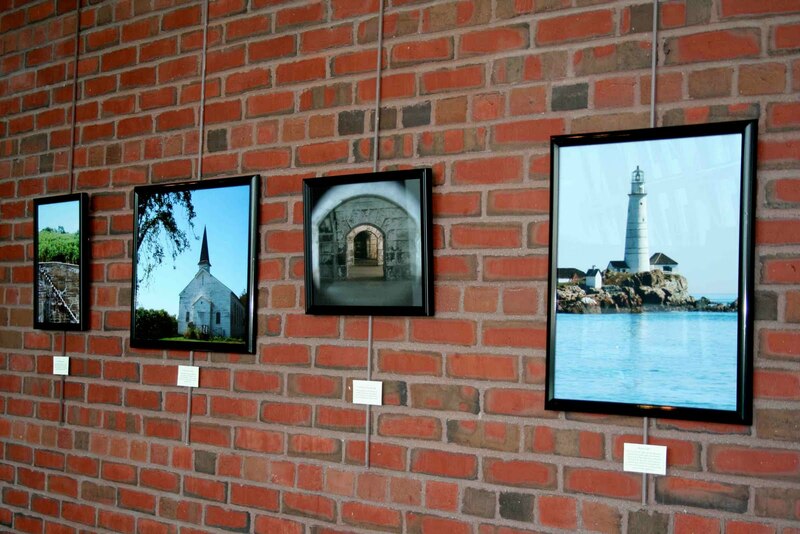 The photographs are on display in the second floor atrium through September 30. 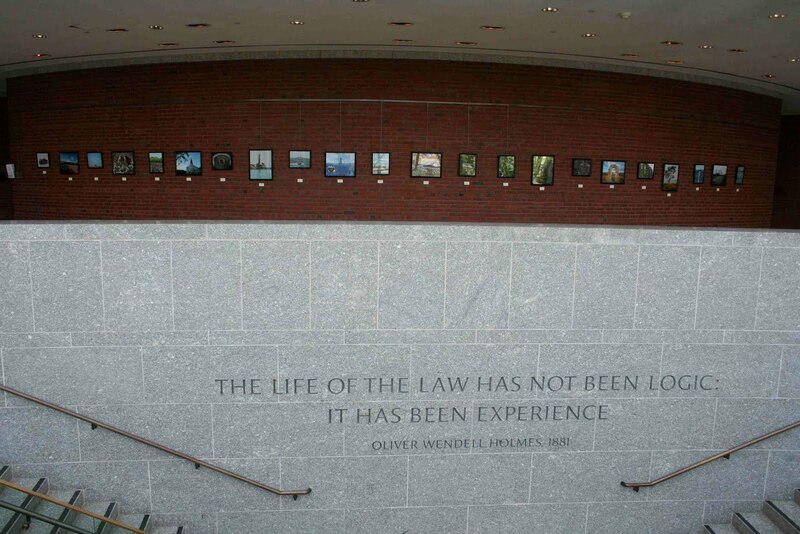 The setting for the exhibition, with picturesque views of Boston Harbor through the courthouse's huge windows, is fantastic and ties in perfectly to the theme of the exhibition. The photographs in the exhibition highlight the islands' natural beauty, wildlife, and recreational offerings along with some of their historic structures, such as lighthouses, cottages, cemeteries, and ruins of military forts and lavish estates. Many of the photographs in the exhibition are featured in the pages of my book Discovering the Boston Harbor Islands, which offers historical narratives and contemporary portraits of each of the 34 islands and coastal peninsulas in the Boston Harbor Islands national park area. 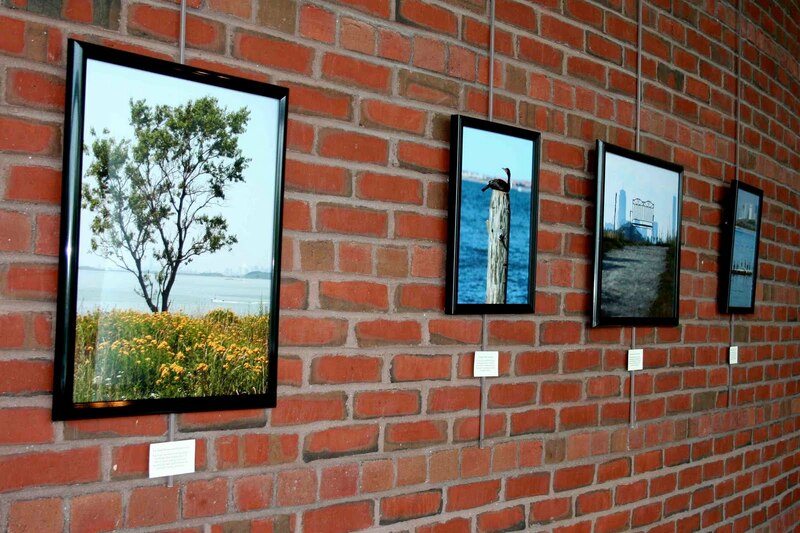 To see the photographs of the Boston Harbor Islands that are on display, click here. If you are interested in purchasing any prints of my Boston Harbor Islands photographs, e-mail me. The Moakley Courthouse is open to the public on weekdays between 8 AM and 6 PM. A picture ID is required to enter the courthouse. I'm a big fan of Stephen Puleo's book Dark Tide, a riveting account of Boston's great molasses flood of 1919. I was very happy to see that Dark Tide has been selected by Boston.com readers as the first title for its online book club. Dark Tide was voted ahead of other great books of local interest, some of which were written by big-name authors, so it's a testament to the quality of Puleo's writing and the engaging nature of his story-telling. So, I was naturally interested in reading Puleo's new book, A City So Grand. The book chronicles the history of Boston in the second half of the nineteenth century and the incredible technological, social, and political innovations that were first pioneered in the city and later altered America. Puleo begins his tale with an account of the return of the runaway slave Thomas Sims from Boston to the South in 1851 and uses that event to detail the leading role that Bostonians, in particular Charles Sumner, played in the abolitionist movement. The book discusses the city's role in events that transformed America, such as the Civil War and the massive influx of Irish immigrants, as well as Boston's Great Fire of 1872 and the creation of the Back Bay. There are also large segments devoted to the creation of the first subway in America and Alexander Graham Bell's invention of the telephone in his little workshop in Boston. What I found really interesting were Puleo's passages describing the pageantry of great city-wide celebrations such as the Great Railroad Jubilee of 1851 and the Great Peace Jubilee in 1869, which drew attendees from all around the world. I had never heard of these events before so it was really eye-opening. Puleo could have written another 320 pages about Boston's history between 1850 and 1900 and not run out of stories. Personally, I would have enjoyed reading more about the pioneering role of Bostonians such as John L. Sullivan and George and Harry Wright in sports in the late 1800s. The sports-crazy city that we live in today was born during the time period covered by Puleo. I grant you, though, this is just a personal bias. While the book is a great read, I couldn't help but feel a little melancholy about the Boston of today compared to the Boston of the 1800s. The list of achievements by Bostonians back then seem to surpass our contributions to American life today. Back then, Bostonians literally moved mountains to resculpt the city, filling in waterways and creating the Back Bay. Puleo writes that the Great Coliseum, 500 feet long and 300 feet wide, that held 50,000 people for the Great Peace Jubilee was built in just 90 days. 90 days! Boston still plays a leading role in science, technology, and education. In the last 20 years, Boston has had some notable achievements such as the cleanup of Boston Harbor and the Big Dig, but even while the Big Dig was an engineering marvel it was a long, protracted project and not necessarily a source of pride. These days, we can't even stage an event such as the Parade of Tall Ships without constant bickering and political infighting. There's a huge hole festering in Downtown Crossing where the old Filene's building, a Boston institution, once stood. I fear that it's becoming a symbol of a can't-do spirit in the city. Could Boston build the Great Coliseum in just 90 days today? I doubt it. Puleo touches on the contrast between yesterday and today in A City So Grand: "Long before the frustrations of our modern era, in which the notion of accomplishing great things often appears overwhelming or even impossible, Boston distinguished itself in the last half of the nineteenth century by proving it could tackle and overcome the most arduous of the challenges and obstacels with repeated--and often resounding--success, becoming a city of vision and destiny." Puleo includes this quote from Ralph Waldo Emerson in the book: "Boston commands attention as the town which was appointed in the destiny of nations to lead the civilization of North America." My question is: Can we say the same today?